Go Ahead, Treat Yourself! Super Cool Riverfront Cabin, Full of Light Thanks to Wall-of-Glass Views (woods not river), Clever Artful Decor, Gas Fireplace, Fenced Yard, Lawn, Hot Tub. Perfect-for-Hanging-Out Dining/Lounging Deck. 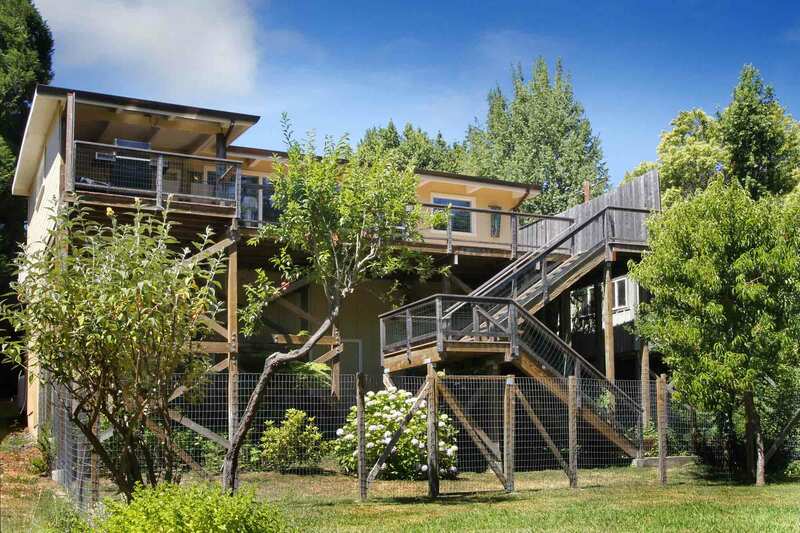 Short Walk to *Seasonal Neighborhood Beach Access & Boats; Very Short Drive to Downtown Guerneville, Public Beach, Dining, Wine Tasting, Redwoods, Golf, Coast. Wi-Fi, Landline Phone, Cable TV. Keyless Entry. Your Well-Behaved Dog is Welcome! Beach Retreat’s living room is open to the kitchen, with a dining area. 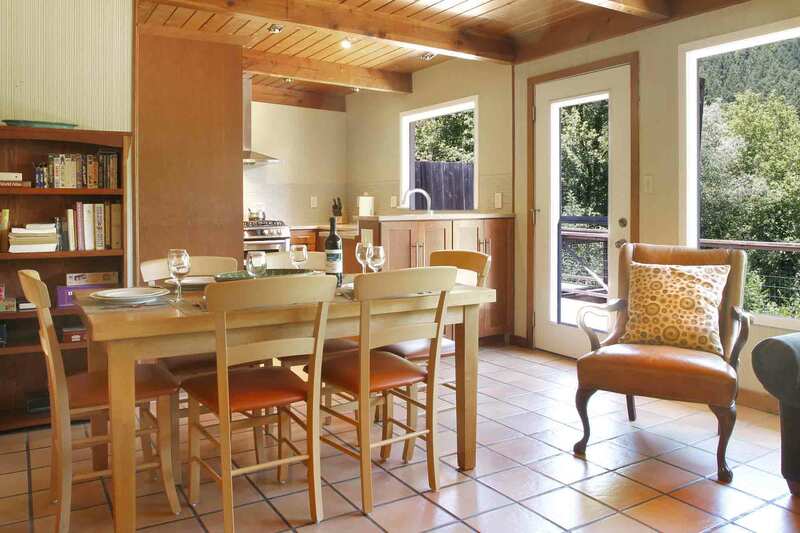 The kitchen opens to the rear deck, outdoor dining, fenced yard, and river access. 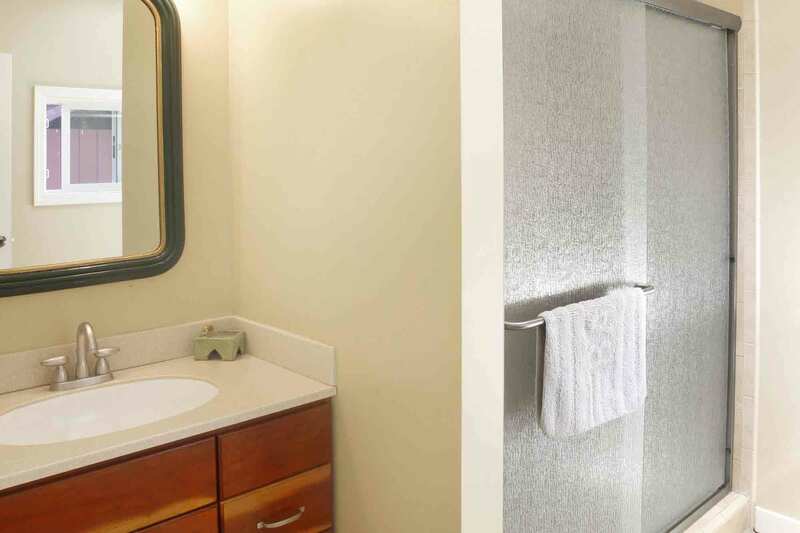 Down a short hall from the living area, there's a master suite with full bath and direct access to the hot tub deck. Directly off the living area, there are two bedrooms, one with direct access to the hot tub deck, and a bathroom. Out the front door, there's a deck with hot tub and privacy fencing. The rear deck has outdoor dining. From the rear deck, there are stairs to the rear yard and fenced dog run. A gate in the fence leads through to the rest of the yard and to the path to the *seasonal neighborhood beach. 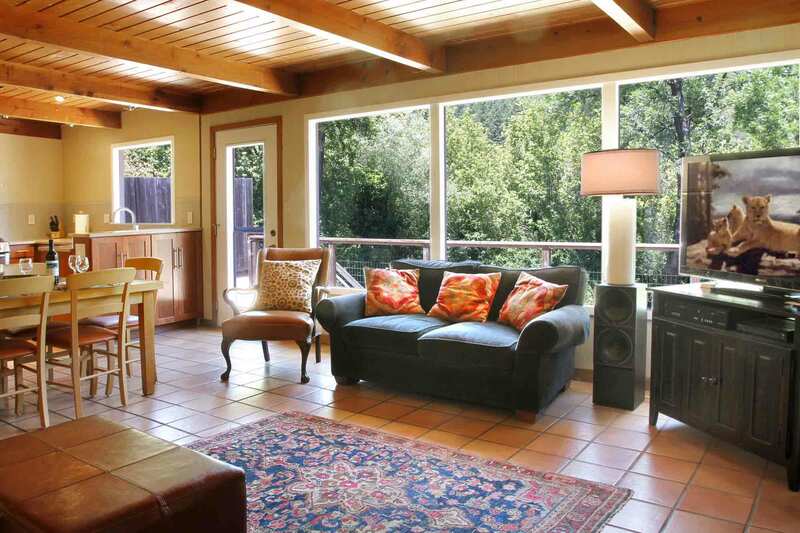 House is approximately 1300sf. Note this home does not have a river view, but there are no other homes between the house and the beach. Gas Fireplace (living room), Baseboard Heat. Limited A/C. "Well stocked with what you need for the stay"
Seamless check in and check out process. Well stocked with what you need for the stay. Some complimentary toiletries would be appreciated - body washes, simple shampoos and small toothpastes perhaps. People tend to forget their body washes. Consider lowering the cleaning fees for short stays. Great spot for a long weekend away with friends! We greatly enjoyed the huge window looking out to the woods, the living room fireplace, and the hot tub. Was a little more out-of-the-way (down a narrow winding side road) than I expected, but only 5 mins drive so not a big deal at all. The Russian River area was awesome - full of great food, drinks, and views. Would be lovely to come back in the summer so we could make use of the river too! Great area and views. Enjoyed my stay very much. Kitchen was well equipped. "We had an amazing week at this beautiful home." We had an amazing week at this beautiful home just steps away from the river. It was the perfect location for our family and friends to have a wonderful Thanksgiving together. "Great location on the river." Great location on the river with easy Check in process. "The kitchen was very nice and updated." We enjoyed this home a lot. It was very clean and well maintained. The kitchen was very nice and updated and had all the pots and utensils you need to enjoy at-home meals. The dining and sitting areas were comfortable for socializing and had good light through large pane windows facing the back yard. The hot tub would have been better placed in the back rather than the front, but we still enjoyed using it in the front. We had a great stay! The house was clean, plenty of towels were available, the hot tub was great, and the kitchen was well equipped for our cooking needs! We really enjoyed being able to hang out on the deck and enjoy the scenery every morning and evening The location was great, it was fun to walk to the river every day! We look forward to visiting again some time! "Dog run was a really nice touch." Great spot. Lovely deck and hot tub. Dog run was a really nice touch. "Very comfortable with gorgeous views. " "Loved the large open windows that looked to the trees and ridge-line." Kayaks were a hit with the kids, very pet friendly. Hosts were easy to communicate with and helped with our extra needs. The space was pleasant and the use of boats and floats was a great touch. Recommend! "We very much enjoyed our stay. " We very much enjoyed our stay. The place was very clean and homey. And the kitchen was, thankfully, very well equipped! A rare, and very much appreciated, bonus for a rental cottage. What a great place to stay! We really enjoyed the top-notch kitchen - appliances, cookware, dishes, etc. were all high-end. Had a great time cooking at home (bbq is a Weber) and dinner outside most evenings. The deck is wonderful for relaxing and spending some time in the sun reading. The Jacuzzi is a big plus and was sparking clean. The location is quiet and serene. If you like to kayak, this is a great opportunity to do just that. Each morning we took the kayaks out on the Russian River (short walk) - what a great way to start the day! The house is clean and well laid out. The bathrooms are updated as well as the kitchen as I mentioned earlier. There is a washer and dryer - handy if you are in/out of the water during your stay. Also, they have games, books , etc. for your enjoyment. The TV and WIFI worked very well. I'd definitely stay here again! "Great place to stay in and enjoy a nice getaway"
Great place to stay in and enjoy a nice getaway. Highly recommended. Nice shops and places to dine at close by. Will definitely return! "The home itself is wonderful"
The home itself is wonderful. Lots of great bonuses like a nice hottub. Big beautiful deck. A grill. Nice fireplace. The only minus is the location. If you don’t mind being in a residential area, it’s a very nice home. And the hosts are very helpful and nice. Would recommend.
" We greatly enjoyed the huge window looking out to the woods." "The layout of this house was amazing..."
The layout of this house was amazing and it made me want to own the place myself. I would rent this place again in the future. "We loved the area and being so close to the river"
We loved the area and being so close to the river. We loved being close to great restaurants and wineries. We appreciated the check in book that gave some great suggestions on where to go and where to eat. The house had everything we needed and was very comfortable and clean. Access to the river and use of the kayaks was a definite plus. I think the place is portrayed as remote and quiet and there was quite a bit of road noise. Also basic amenities like a bar of soap would have been appreciated. I asked about a pack n play and I was told I needed to pick it up at the office which was close by. It would have thought it would have been easy to drop it off if the office was close. We were worried about not getting the pack n play before the office closed or other snags so we just brought our own. We went without wifi for the entire weekend which was pretty frustrating when we rely on wifi and the service was very spotty to begin with. Lastly, I was asked to sign a separate agreement outside of airbnb website in order to get check in instructions. Thanks for the review and feedback Aubrey. We do apologize about the wifi; your refund should have been processed. Despite the lack of wifi, we hope you enjoyed your stay in this lovely home and area. The Good: Nice Kitchen, Nice separate bathrooms, great deck. Plenty of room for 4 people (2 couples). The Bad: No internet. In theory it is there but while we could connect to the router, no internet connection was available. We had to drive 35 minutes to Santa Rosa to get an acceptable connection to work for 1 hour. Calls to the office were sent to a recording and the house "book" said to call Comcast, which we did. Guess how that went? 2 hours on the phone and nothing. Air Conditioning. If you want it, it has to be over 90 degrees and you have to call and get a code. We were out during the day so only came back at night and the house was very hot and no one ever answered the phone. Two nights we couldn't sleep until after 1 AM due to the heat. There were fans but it was still way too hot. The misleading: River View. There isn't one despite the nice picture on the profile. All you see are trees. I like trees but thought we had a river view. You can walk to the river but you can't see it from the house. Overall we liked the house but didn't love it for the internet, lack of non-stick pans in the otherwise nice kitchen, lack of air conditioning, lack of river view. If the price was 33% lower it would be a probability of renting again. Thanks for the review and feedback, Andrew. We hope you were able to enjoy your stay at Beach Retreat, despite some challenges. It sounds as though your expectations were not met, and, for that, I am sorry. I'm sorry about the internet, but also a little confused, though, because it sounds like, while you called the office, you did not actually speak with anyone who could have helped you, and we have 24/7 urgent care for exactly that purpose. If we received messages left at any time of day, we would have reached back out to you, so I'm not sure what happened there. Also, so you're aware, there is plenty of internet in town, no need to drive all the way to Santa Rosa. Finally, we do say in the description that there is a forest view, not a river view (a river view on a neighborhood beach would also mean a lack of privacy): "Riverfront Property with Forest View." The photo is of the beach itself. In the section for air conditioning, it says: "Air-Conditioning (+ 90 degrees only)." Weekends so hot are fortunately rare. We'll take a look at the pans and get replacements, if needed. The home was clean 95 of 100. Previous renter left some dog waste in the yard. The home was well equipped for cooking which we did for three days, we used the kitchen and the gas grill outside. The rooms were a decent size and we loved the proximity to the river beaches, the shortest time was under 2 minutes but we went to the the beach that was within 3.5 mins, we had a choice of 3. We swam our butts off non-stop for 4 hours and got a nice tan, the weather was fabulous. We will come back next year for sure. Great location -scenic picture windows on to the back deck with a path to the beach- pretty ideal! We had four small dogs with us and it was a perfect trip for them and us. We could let them run around as the garden was so secured but enough space for them to play. The house was clean and spacious for us (4 adults and 4 dogs), it is in a very beautiful setting with the river just beyond the trees - we felt very peaceful sat on the large deck. House is good but the neighborhood was a bit sketchy. Great location; my family really enjoyed our stay at the beach retreat. Would definitely return. "Everything about this experience was beyond ideal"
Everything about this experience was beyond ideal. Communications with the rental company was seamless, early and accurate. They emailed me check-in details with alarm codes two days before our arrival and even provided a handy app. The house was super clean when we arrived. 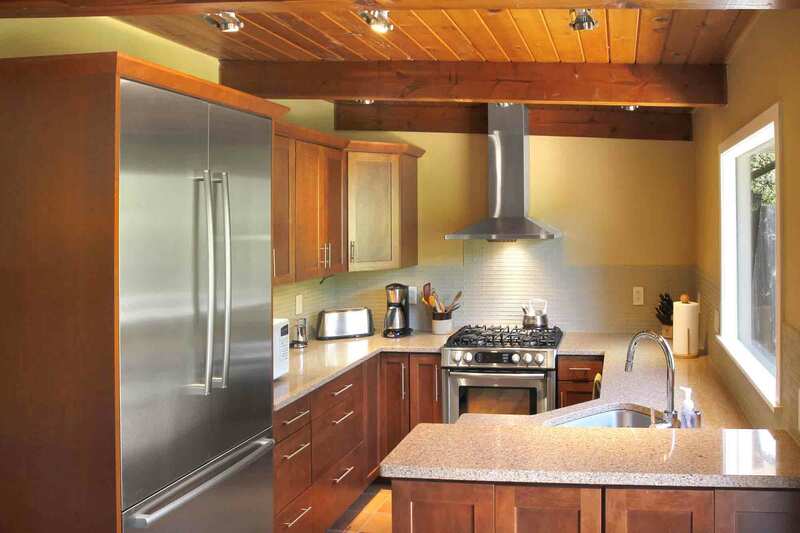 It was the perfect size for our group of 6, the kitchen was very well-equipped, and had all the amenities one could need for a long or short visit. The beds were SO COMFEY too. We loved the proximity to the river and the neighborhood was cute. We'd definitely rent this again. Great little spot. 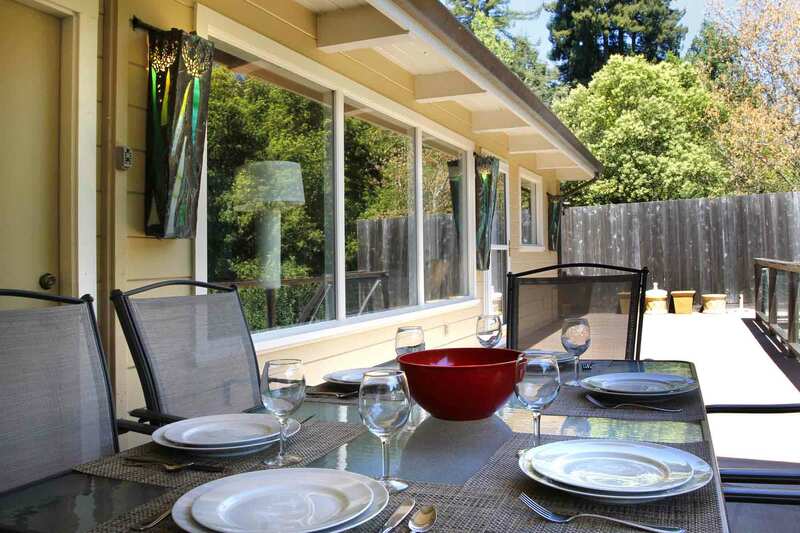 The Beach Retreat is a really great spot to spend time when in the Guerneville area. 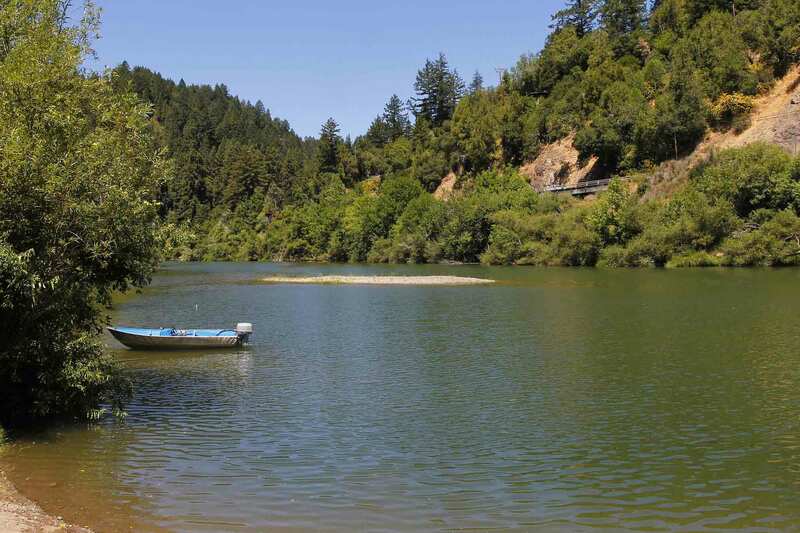 It is only about a eight minute drive to downtown Guerneville and yet is only about a five minute walk to a private beach area along the river. The view from its balcony is lovely (although there in no view of the river itself) and provides perfect privacy. 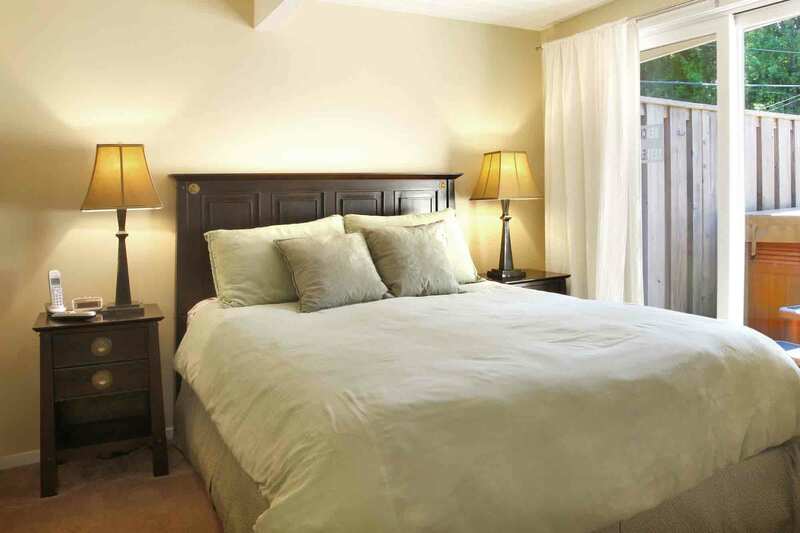 The master bedroom is separate from the the rest of the house and also provides privacy and quiet that are very nice. The kitchen has recently been remodeled and the appliances were very nice. Parking for up to three cards is conveniently right out front. The fenced-in yard is great if one had dogs. On the other hand, when the place gets warm, it is hard to get air circulation because the only opening in the back of the house is the back door to the balcony. When sitting outside, there is some truck noise from Highway 116. While overall quite nice, parts of the house looked a little shabby -- an ottoman in the living room that has seen better days, moldings that need care, some parts of the house the cleaners missed (dust), a kitchen that had basic supplies but we've seen better (e.g., salt and pepper were supplied but no other spices). The balcony railing was not as sturdy as one might like. Especially near the gate it seemed really wobbly. We wanted to do a really good job of cleaning up as we had dogs with us, but the vacuum cleaners in the house were in poor condition and made extra work for us. "Perfect place for a wine tasting getaway"
The listing was very representative of the location, layout and amenities. The property was very clean and well-maintained The owner provided great service and good communication of everything we needed to know. I would recommend this property to family and friends. 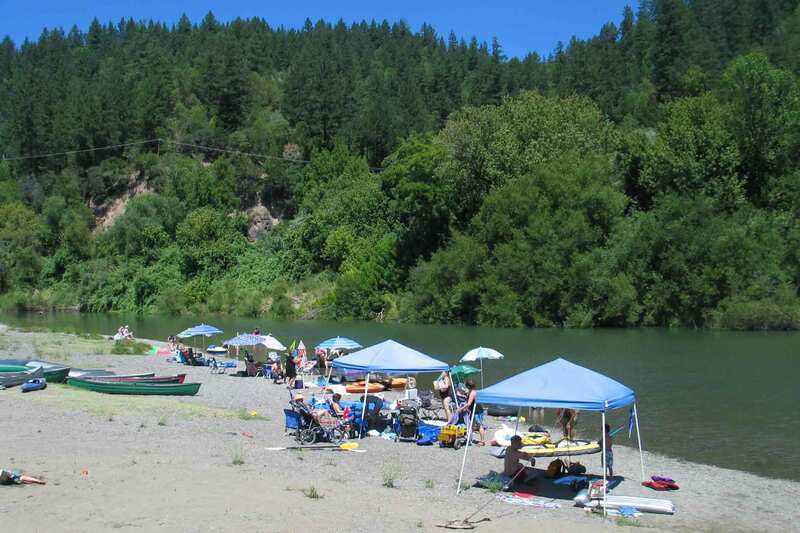 The property is at a great location for wine tasting, visiting town or any water activities on the river. Loved the deck and the hot tub! Russian River Rentals were on top of things when we called them for more towels. Kayaks were a lot of fun although the access to the "beach" was less than I ideal-mostly mud. 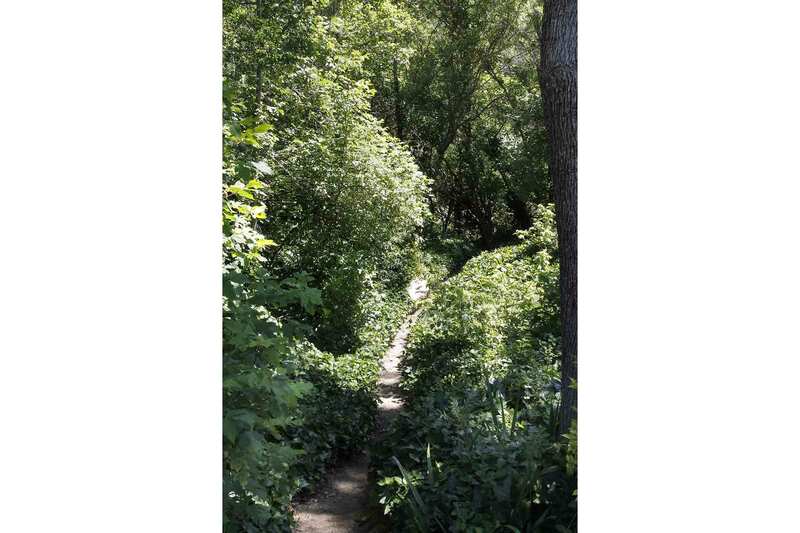 Good location, nice neighborhood, quite close to river. Well appointed house. 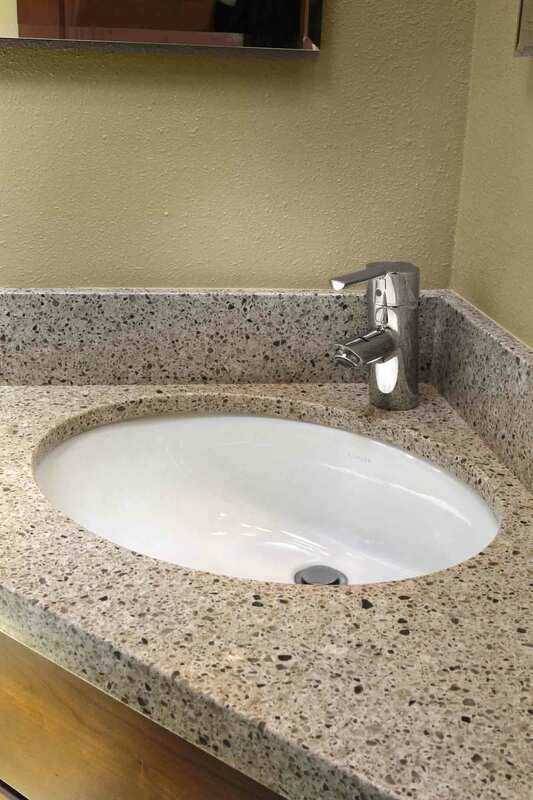 Great small kitchen and nice new clean bathrooms. House could be rather warm on a hot day. All review is positive. "Comfy bed, fantastic kitchen , art work creepy"
Being at this house over Christmas was a nice get away. Kitchen had everything and more to prepare a traditional holiday meal. As a Personal Chef that has cooked in many vacation homes both as vacation and professionally this was a real surprise and treat. The King bed was so comfortable. I wanted to take it with me (LOL). The art work overwhelmed my toddler and we had to try and hide it. Personal expression is wonderful but if your opening your doors to an assortment of people (ie: families with kids) things should be more neutral in my opinion. The big TV was awesome to watch a holiday flick and curl up with my teenager. Thanks for the space. We're so glad you enjoyed Beach Retreat and thank you for the review. The owner took heed of your advice and removed the art work to which you refer. We do hope you'll return to enjoy the house. "great house, great location, creepy artwork"
loved the house, the amenities, nice remodeled kitchen and baths-very well maintained and great location with access to neighborhood beach and swimming hole with 3 kayaks-loved everything except the creepy piece of art in the master bedroom-used a sheet to cover it so I could sleep at night- otherwise awesome. Beach Retreat is a great home, even better now that the owner has removed the artwork that was problematic for you. Thanks for sharing your experience, and we'd love to see you back at the River soon! This is a very nice 3 bedroom, 2 bath house with recently up graded kitchen, a huge improvement over the previous kitchen as we have rented this house before. It is in a very quiet neighborhood on a private neighborhood beach although people passing by on the river do stop there. A very nice big back lawn with fruit trees and short path to the beach. Elizabeth who stayed with our dog one evening is very wonderful. We have used her previously and she lives in the neighborhood. Thanks for your kind words about Beach Retreat and Elizabeth, who is indeed fabulous with the pups. We do hope you'll be back again soon! This is the best dog friendly cabin we have stayed in. Great fenced yard. You do need to be able to climb many steps to be comfortable here and the week we stayed it was very hot so the bedrooms were very hot at night. Comfortable beds, close to river, nice kitchen, good BBQ and a deck to die for. Took advantage of the hot tub too. The homes along the river have been raised because of the potential for flooding in the winter so many have steps to get to the main living area. As for the heat we did have an unprecedented HOT week here on the river the week you stayed with us. I don't think there was anywhere, except the river, that you could have stayed cool! Beach Retreat is a great home and it's nice to know that you enjoyed your stay even in that miserable heat! "Comfortable place and fun location for an active family holiday"
Our little family of 3 couples had fun together cooking, sitting in the nice hot tub on a private deck, cycling into town for groceries, and walking along the river. Our dogs were very secure in the yard and fascinated to have a balcony level view of squirrels in the trees. We really enjoyed touring local wineries' tasting rooms, hiking in the redwoods parks, and beach-combing along the Pacific shore. Five almost perfect days went too quickly. One person was even able to work remotely with her team in SF, using the table on the deck and the excellent WiFi connection while enjoying fresh air. The only issues were that the dishwasher isn't really useful, a few light bulbs were burned out, and we had not expected to provide our own toilet paper and paper towels (not a problem to run into town to buy). A little local store called "Food for Humans" had everything for us to be able to make a gluten-free, lactose-free, happy camp for a most wonderful Thanksgiving that pleased our most sensitive member. Beach Retreat is getting a new kitchen this winter, so the dishwasher issue will be solved. We do provide a starter supply of of tp and pt, as we describe in detail on our booking policies page. If this is ever missing, we are just a phone call away. I first want to say that working with Russian River Getaways was great. 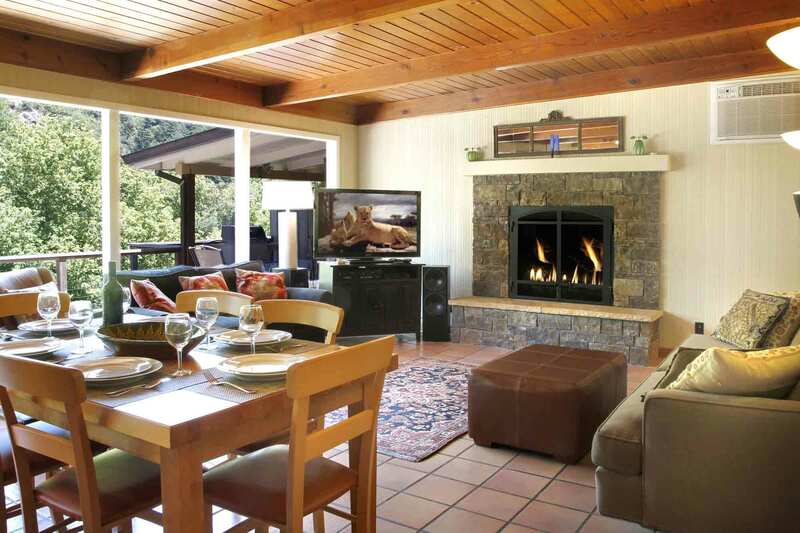 We have rented homes for vacation numerous times and we found Russian River Getaways very professional, easy to work with, incredibly organized and helpful. It was nice not to have to worry about a deposit, would we get the deposit back, etc. Thank you for that. The house was adorable and plenty for the 5 of us and 2 dogs. The dog run was perfect. The house really had everything to accommodate us. I would recommend. Thank you so much for the compliments and for sharing your experience of Beach Retreat. We hope you'll be back again with us soon. 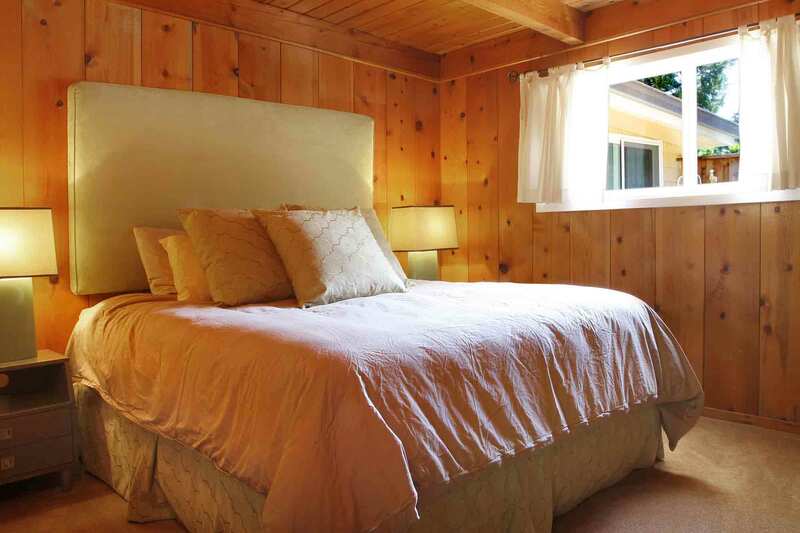 "Fabulous Retreat among the Redwoods!" 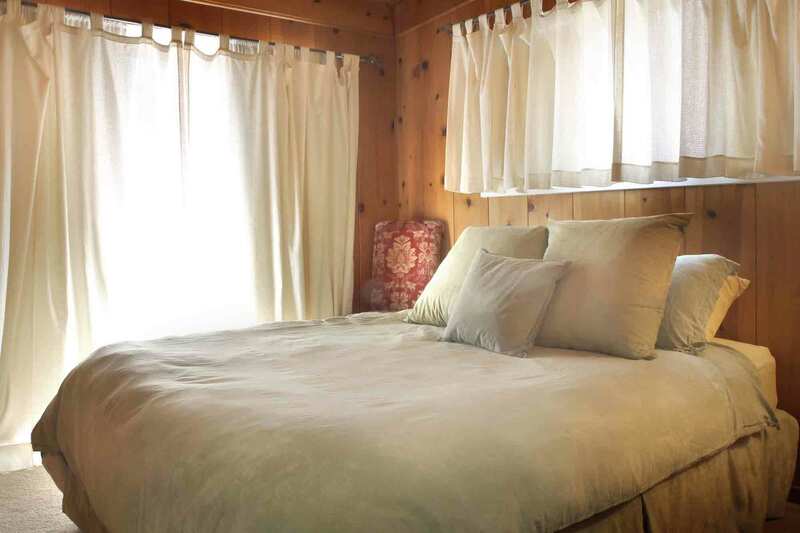 we recently returned from the Russian River, staying in the cozy Beach retreat - we are a family of four with two small boys age 3 1/2 and 20months and the house was perfect. 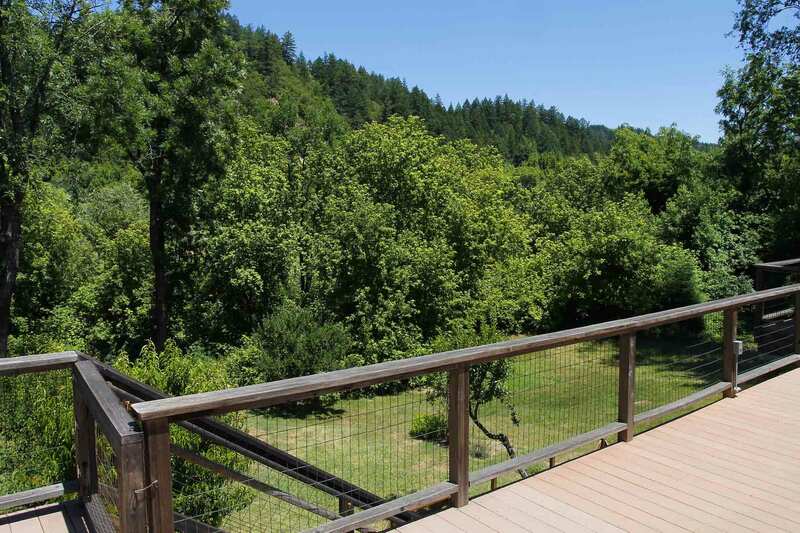 Short walk to the river, fenced in small yard and gated deck. The kitchen needs some updating though - the dishwasher is portable and had started to leak upon our departure, and the stove range probably needed an upgrade. Plus for any families, there did not appear to be any plastic dish ware so perhaps bring your own for small kids? We would definitely stay again! Thank you very much for your review...the kitchen has been completely remodeled and now has plasticware. We hope you'll come back and check it out. You are so welcome! Thanks for your review, and we hope to see you back at the River soon. "A Mother's Day Weekend to Remember"
This close to river front house was just ideal for a family of four plus one five month old lab/sheppard mix pup. Bedrooms, baths, kitchen &amp; just about everything else was perfect for a nice family getaway. 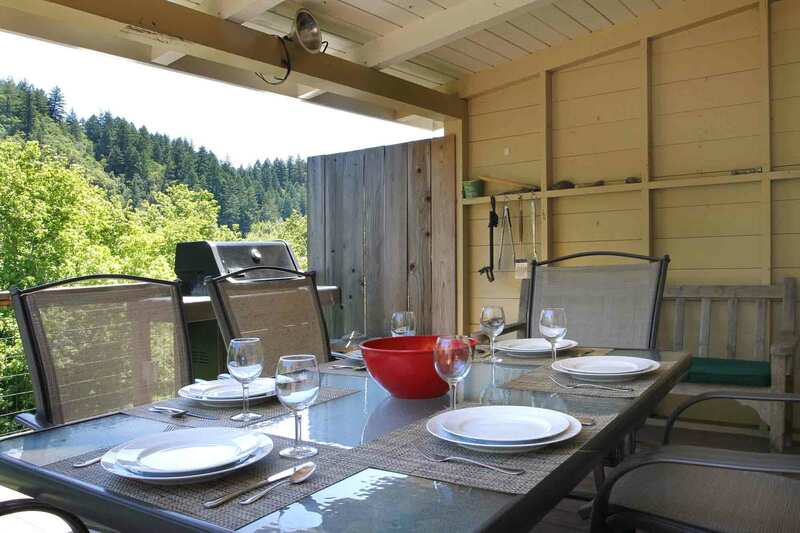 With an expansive deck that wraps front to back, nice sized hot-tub, good view from back deck, privacy, and a short walk to a large Russian River beach, this property has all the qualities for a fun and relaxing stay. The dog enclosure feature was much appreciated. Cozy is the best word for description. The only not so cozy thing about the place were a few of the paintings on the walls. I think our youngest child might have been a little worried at first. Other than this we had a wonderful stay and would love to return in the near future. We rented this house for the weekend with another couple and had a great time. The house has everything you need (except bath soap :) ) and the fact that the deck and yard are fenced means, as an over protective dog mom, I could relax on the deck without having to watch her every second. The house also comes with everything you need to have a fun day at the river - inflatable tubes etc... which is what we chose to do. Its a very short walk down the path to the river. You can then come back and just throw all your towels etc. in the wash. The house is clean and there is enough distance between the two larger bedrooms for privacy. We would definitley rent this house again. Thank you for a lovely fun weekend! "wonderfully relaxing trip with the dogs"
the cabin was exactly as described. we had a great trip with our dogs, who love to swim. the fenced in area of the yard was perfect. and the river was just a short walk through the yard-- close enough to get to in a minute, but far enough to not drive my dogs crazy. it would have been nice if there were more places to hike along the river from the property, but all in all a great place to stay. We had to book last minute and we were unbelievable lucky to come across the Beach Retreat thanks to Julz. It was perfect! It felt like it's own universe. The beautiful trees, the private hot tub, the deck, the lawn and the dog run which was very convenient for our old pooches. This is going on our list of best places to stay in Guernville and the house itself is so lovely with all the wood. Reminded me of Tahoe. It could be a cozy romantic getaway or perfect for a family. Flexible and wonderful! And the beach is right there. We didn't even miss a view of the river with all the trees. "Great place, beautifully done, spacious, not enough kayaks." The house was wonderful, beautifully done, well outfitted. Hottub and decks were perfect. Night view of the stars was awesome. River access was good. Not nearly enough kayaks for 6 people. Had only one tandem and one single. Should have enough for full crew of 6. Playing on the river is one of the reasons we were there. Left our own kayaks at home because there were more boats available. Next year we'll bring our own.Overall the experience was very good and would rate it 4 of 5 stars. Rrg is a great company and provided excellent service outside of just a wonderful property. Would rent from them again anytime. My family stayed at Beach Retreat for a week this summer and we fully enjoyed it. There are short beaches walking distance that are private and nice for little kids. There was a lot of broken glass though so make sure you wear shoes. The property has a great view from the living room, kitchen and porch. It's nice to sit outside and grill as well. We used the hot tub few times and it was very relaxing. The house gets pretty hot but since it gets cold at night, just leave your windows open. The only thing that could be improved would be cleanliness. There were bunch of spots on the carpets where dogs peed and also the bed covers looked pretty dirty (not sure it they were just washed out but could be updated). Also i wish they provided some beach towels, chairs and beach toys. Had a great stay. The place is medium-sized for a three-bedroom but certainly adequate for us. Comfy seating, big windows onto the rear deck, wonderful spa. Pretty view from back deck and wonderful back year, perfect for lawn games. The house is well-equipped with an endles supply of water toys and floats. 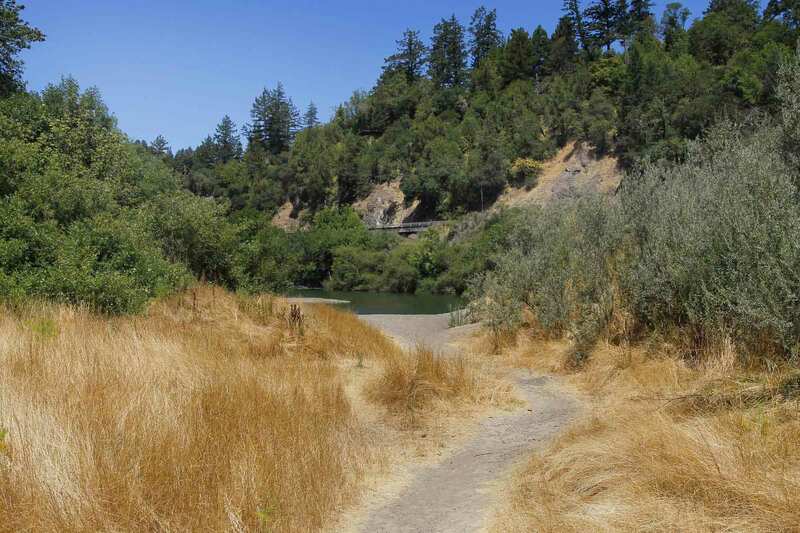 Very short walk to the river, either Drake's Beach or the smaller, sandy beach just downstream. It's one of the best places on the river, we think, because of the proximity of a rope swing and the only island I know of on the river. We especially liked the fact that there is now a place on the beach where you can secure your kayaks, so no more lugging them back to the house every day!Our only complaints about Beach Retreat are 1) the dishwasher is a very small portable unit, and it does not do a great job of cleaning. This is exacerbated by the fact that the plates have very high edges and so do not position well in the unit. Second, two of the three beds have overly hard mattresses; some people may like this, but we didn't.Overall, though, it's a very nice place to stay! We stayed at the beach retreat and had a great time. Super family and dog friendly house/community. The river is a short walk from the house and we basically spend most of our days on the river with our kids and dogs. The house was clean and very spacious for a family of 4. Everything we needed to cook was in the house. Great for entertaining too.Thanks for a wonderful time. The Beach Retreat was amazing! Location was close to the River, with canoes available. Loved the set up of the house... Great Deck with a hot tub. Great place for the Dogs, lots of space. We are deffinately coming back! The beach retreat was a comfortable home with a great location for our vacation. My husband was participating in the vineman race and the house was a perfect location for all of the activities we had to do. We also enjoyed being able to walk to the river and swim with our son. The house was small but had all the amentities you need. I wish the kitchen had been cleaner, but other than that is was great. The house was charmingly decorated, and it's neighborhood was pleasant and quiet, just perfect for our daily walks. The bed in the master bedroom was very comfortable for both of us. Access to the close-by beach was easy and our water-loving dog super relished her twice daily trips down to the river. We enjoyed the large deck and spent some lazy hours on it and on the beach, soaking up the October sun once the morning mists had evaporated. However, two amenities advertised as coming with the house were missing. The expected kayaks, which we would certainly have used, were nowhere to be found. Also, internet access was down, which stalled the plans of two of the four adults in our party to work on-line during our visit. That was a real disappointment and a call to the rental agency did not result in a repair while we were there. Hi, thanks for the feedback. Sorry you didn't find the kayaks; the instructions for finding them are in the binder. They are in the basement underneath the house. There are also instructions for resetting the modem for the Internet access. We can't repair the Internet access, but the reset is a simple process. "great place for kids and adults"
perfect for families or a group of 3 couples. big wrap around deck with safety gate for toddlers. 5 min walk to beach (bring the jog stroller --rough terrain) or 10 min drive to town. it was a perfect place. 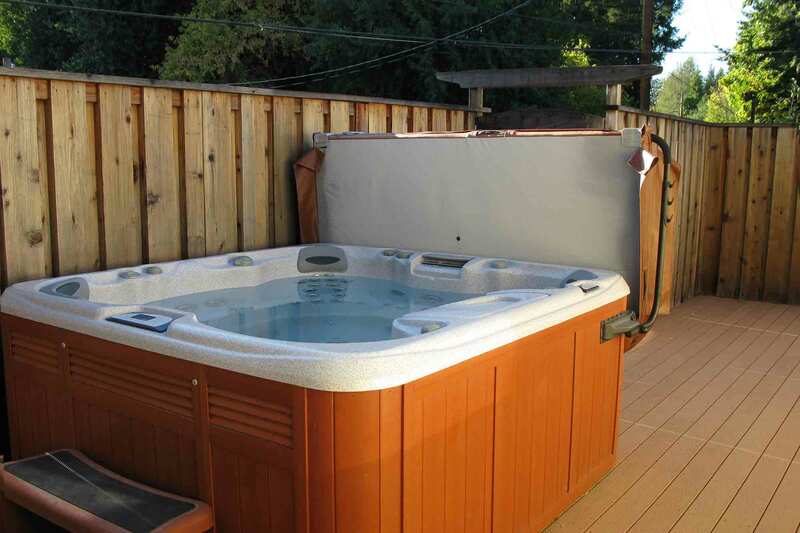 the only weird thing about it was the master bedroom has very little privacy from the hot tub and front deck area. you might want to bring a queen size dark sheet to put up over the very sheer curtain on the picture window next to the bed, and another smaller dark sheet to put over the all glass door to the bedroom, that looks right out through the all glass front door!other than that we had no complaints and would go back in a heartbeat. I was at the Beach Retreat with my husband, my 65 year old parents and my sister and her husband - we all loved it! The house is not huge but the rooms are very comfortable and everything was very clean. The master bedroom shower is wonderful. There was plenty of room for the 6 of us to watch movies on the DVD player in the living room together. There are a LOT of stairs - both in front and in back - so the house would not be good if you can't take stairs.It was great to be able to have my little dog with me during vacation - thanks to the owners for allowing well behaved dogs.The back porch is an oasis and the beach within walking distance was perfect. The kitchen was well appointed and - well - we just loved it. If you want to relax and enjoy doing very little this is the place to be! We had a fabulous time at Beach Retreat. Loved the hot tub, access to the beach, kayaks and tubes. The back patio was great for grilling, dinner, and relaxing. Love the common space too--great expansive windows make it bright and nice view of the trees. A great place to relax!! The location is perfect, close to town but with a little privacy too. Would definitely stay here again. Only issue was that the bathroom for the 2 bedrooms was a bit small for sharing by 4 people and both bathrooms could use some bleach or re-caulking at the base...there's a bit of mildew. We liked the Beach Retreat, this was our second year there. My husband and I shared the 3 bedroom house with my daughter and her husband and their two children ages 3 years and 6 months. The house is nice, big living area/kitchen, nice bedrooms back deck, etc. It's sweet because you can walk to the beach and the beach there is pretty nice. The big problem we had was the flies. There was no screen door so when you wanted to leave the back door open you were beset with flies. We have pictures of the six month old napping with flies on her. We complained about the problem but nothing was done about it while we were there. We kept being told that the owners were not responding to email and that they had to sign off on a screen door. At one point someone at RR Getaways told my daughter to go buy fly paper and keep the receipt for reimbursement. Ultimately, after many calls, someone was sent to try and give us a screen door, but not until our last day, and he was not able to install the door. Also the dishwasher is way too small for a cabin which is probably ok for 6 or so persons. Other than that it was great. But please.....do something about a screen door! The whole point is to enjoy indoor and outdoor living with that big deck. Having to keep the door closed to avoid flies, or keep the door open and get a house full of them, was a downer to our much anticipated family vacation. We're so sorry about the flies; this must have been a major hatching event as we've never had this problem there. In any case, this was mis-handled by the staff person who was at the office the day you complained and she has since left our employment. Delivering fly strips was fine, but you should have gotten a screen door right away. The screen door, which unbeknownst to us had been taken down and stored in the locked garage by the owner, has been re-installed. So we hope you come back and enjoy a future no-fly vacation. ENJOYED THE HOUSE AND HOMEY FEEL. HOWEVER, WHEN WE ARRIVED:AC DID NOT WORK: HAD TO HAVE BREAKER FIXEDJACUZZI(VERY NICE) WAS DIRTY; HAD TO HAVE IT SERVICEDBBQ WOULD NOT HEAT UP; HAD TO HAVE IT REPLACEDTHIS ALL TOOK TIME AND PH. CALLS. HOWEVER, RESPONSE WAS WONDERFUL &amp; timely. EVERYTHING GOT FIXED.SUGGESTIONS: KITCHEN NEEDS UPDATE, E.G. CUPBOARDS, DRAWERS, ETC. WHERE TABLE IS UNDER WINDOW, SUGGEST BUILT IN SIDE- BOARD/CUPBOARDS FOR MORE STORAGE &amp; POSSIBLY BETTER PLACE FOR MICROWAVE. SML. BATHRM. ALSO NEEDS UP DATE.NEED LIGHT OVER TABLE.DECK WAS FABULOUS(WITH GATE) AS WELL AS GRASS AREA AND SHORT WALK TO RIVER. KAYAKS WONDERFUL. SUGGEST FENCE ON ONE SIDE, ESP. IF DOGS ARE ALONG.LAUNDRY ROOM WAS GREAT AND CONVENIENT.ESP. GOOD PLACE TO STAy if have pets. This is a gorgeous house - nicely decorated and very close to a wonderful neighborhood beach. Not a "party house" as there are very clear instructions about cleaning up and it is pristine. THIS PROPERTY WAS SO MISLEADING IN THE PHOTO'S, THE SPA IS IN THE FRONT OF THE HOUSE AWAY FROM THE BBQ, THE TRAIL TO GET TO THE RIVER WAS HORRIBLE, IT DID NOT HAVE A RIVER VIEW, THE RIVER SMELLED HORRIBLE, THE HIGHWAY WAS ACROSS THE STREET FROM THE RIVER ON AND ON I CAN GO. IF YOUR LOOKING FOR SECLUSION FORGET IT. WE SWITCHED PROPERTIES WHEN WE GOT THERE. THE ONLY GOOD NEWS WAS THE CUSTOMER SERVICE WAS EXCELLENT! Unfortunately, this is an instance of a guest not reading the very accurate description of this home posted on our website. This river beach is right by my own house and the river certainly does not smell bad--it's just gorgeous there--and we tell everyone that they will have road noise if they rent on the river. It's just the way it is for almost all the river-front homes. 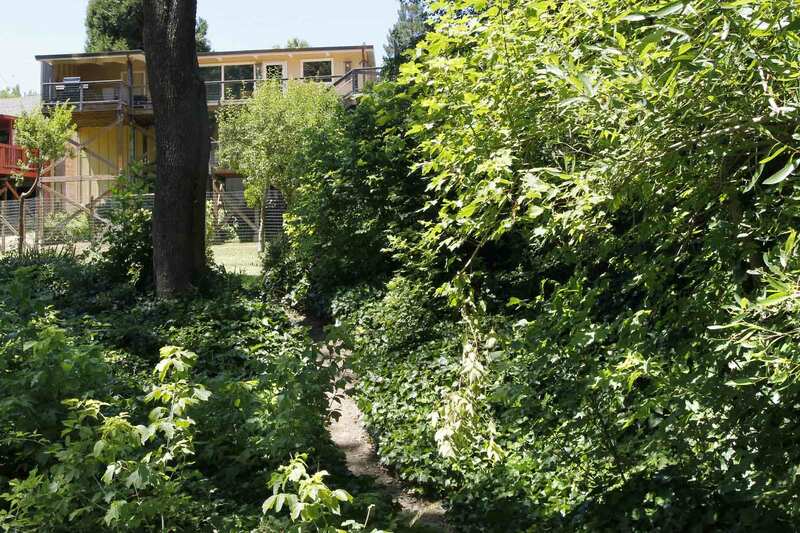 The house webpage says there is no river view because there are trees and shrubs between the house and the beach; otherwise, there would be no privacy. The path to the beach was overgrown and we immediately sent the yard guy out to trim back the foliage. This is a lovely home with very positive guest feedback over the years. There's nothing wrong with the house or the beach or the river; it was just the wrong house for these guests.